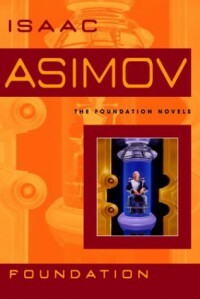 An elite group of scientists tries to keep learning alive during a galactic Dark Age in Isaac Asimov's Foundation. Yes, that's the pithy description, but unfortunately for the reader, the book struggles to live up to this description. One essential problem is how Asimov chooses to set the novel over several generations so that it becomes a group of short stories loosely linked by theme and story arc. The early stories are more compelling, with the last chapter being the least interesting of all; this leaves the reader with the disappointing sense of having walked a great distance for a drink of water, only to find a warm puddle at the end of the journey. Like Heinlein, Asimov isn't so much a literary artist as a storyteller who delights in the devious machinations of plot and situation. Characters get fleshed out just enough to establish basic motivations before they get pushed on their way. There are certainly readers who will forgive these shortcomings in return for what Asimov does provide- however, I'm not one of that crowd. So, while I found the premise vaguely intriguing, Foundation offered me little more. Note: my first review for some time. Trying to come back and finish the year on a positive note after being sidelined with mental health problems for a few months.